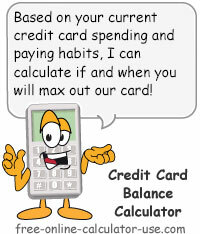 This calculator will attempt to forecast if and when you will max out your credit card based on your current charging habits and making only the minimum monthly payment. This calculator requires that you enter the credit limit on your card and then shows you if and when your balance will grow to exceed that limit. And finally, the results include a month-by-month chart showing the growth of your credit card balance. Forecast future credit card balance to see if and when you will max out your credit limit on the card. Enter the total credit limit (not just the available credit) from your most recent credit card statement. Enter as a dollar amount, but without the dollar sign and any commas. If your credit card carries an annual fee, enter the amount on this line. Enter as a dollar amount, but without the dollar sign and any commas. If no annual fee, enter a zero or leave blank. Enter the average dollar amount of purchases you charge to the card each month. Enter as a dollar amount, but without the dollar sign and any commas. Based on your entered current balance and minimum payment, this is the minimum payment percentage used to figure your monthly payment. The calculator will use this percentage for calculating the remaining payment amounts. If your balance is zero, the calculator will use the default 3% figure. Based on your entries this is how many months the calculator estimates it will take for you to max out your credit card. If the result is n/a, this means that your card will not be maxed out for at least 1,000 months (the maximum number of months the calculator will attempt to forecast the credit card balance). Enter the credit limit on the card. Enter the annual fee, if any. Enter the average amount you charge to the card each month. Tap the "Calculate CC Balance" button and scroll down to view the results. How to Trap a Human Being. Step #1: Starve the human being of the financial education required to instantly recognize a financial trap. Step #2: Hire professional actors and actresses to expertly pretend their lives are infinitely easier and happier after acquiring shiny new and improved widgets. Also hire the professionals to expertly pretend that to attract and hold the love of others, all they have to do is provide others with shiny new and improved widgets. This will cause the human being to believe their happiness depends on how many widgets they can acquire for themselves and others. Step #3: Give the human being a piece of plastic that allows them to acquire the shiny new widgets without having to work to pay cash for them up front. This pushes the pain of having to work for the widgets too far into the future to seem of any consequence. And depending on how well you executed step #2, the human being may even actually agree to pay you an 18%-20% annual fee. Step #4: Allow the human being to take 20 to 30 years to repay the widgets charged on their account. This makes the monthly payments seem too small to be of any consequence. Step #5: As the human being approaches the limit of how many shiny new widgets they can have without having to work for the cash to purchase them, increase the credit limit. In effect, this gives the human more rope to hang themselves with. Step #6: As soon as the human being's monthly payment exceeds their ability to pay, spring the trap by immediately increasing their APR to the penalty APR (29%) and tack on a $35 fee for every month their balance is above the now maximum credit limit, plus another $35 fee for every month their payment is late. This will ensure that the human being is trapped for good. If the above steps fail to lure the human being into the trap, perhaps the human being has spent too much time in the credit card calculators section of free-online-calculator-use.com.